These Puppy Paw/Dalmatian Reversible Fingerless Gloves are fashionable and FUNctional! Bring home a pet, skip the vet. Cute and cozy; these are the perfect dog walking gloves. The Puppy Paw/Dalmatian Fingerless Gloves has 4 patterns and colors that offer a variety of ways to be worn. The Puppy Paw print side has solid white on opposite side. The reverse side is Dalmatian print with solid black on the opposite side. The Puppy Paw/Dalmatian Reversible Fingerless Gloves are made of premium fleece (U.S.A.) and patterned fleece and suede cloth (Imported). 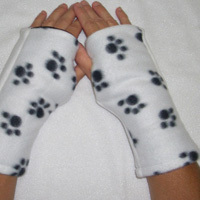 Buy Puppy Paw & Dalmatian Reversible Fingerless Gloves Here! These Puppy Paw/Dalmatian Reversible Hat & Scarf are fashionable and FUNctional! Bring home a pet, skip the vet. Cute and cozy; these are the perfect dog walking hat and scarf. The Puppy Paw/Dalmatian Reversible Hat has several great looks. The Puppy Paw print side with white brim reverses to Dalmatian Print side with black brim and can be worn numerous ways. 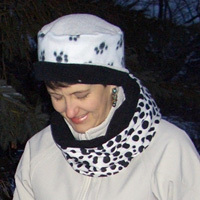 Turtle Gloves Puppy Paw print scarf reverses to a solid white, or turn it inside out for the Dalmatian pattern with a reverse side in black. To get a new look out of your reversible scarf, just slide it over your arm and grip the end. Pulling in thirds, grab the material from your wrist. As easy as that, you have a whole new scarf! Attach the Dalmatian end to the Puppy Paw end for another great look. The reversible scarf is approximately 46 inches long and 6 inches wide. The Puppy Paw and Dalmatian prints are suede cloth. The black and white are premium fleece.